Groundswell Productions landed the rights to the Eisner Award-winning fantasy cop drama. TV’s comic book invasion continues. 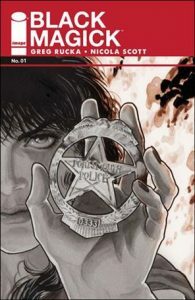 Eisner Award-wining author Greg Rucka and illustrator Nicola Scott’s Image Comics title Black Magick is being developed for the small screen, The Hollywood Reporter has learned. Michael London’s Groundswell Productions (The Illusionist) has landed the rights to the comic following a multiple-party bidding war and plans to develop the property as an hourlong cable or streaming drama. Black Magick, first published in April,is described as a gritty thriller about witchcraft and crime. The comic centers on Rowan Black, a robbery-homicide detective in the fictional port city of Portsmouth, USA, itself a cauldron of occult mystery. She is also the latest in a long line of witches stretching back for millennia. For years, Rowan has struggled to keep a balance between her two lives, but the past is finally catching up to her. Peculiar and mysterious murders draw Rowan into an investigation where the lines between her two lives continue to erode, where she is left with no choice but to harness her powers to not only save the people she loves, but to preserve a future for all humanity.